Angelo, one of the coaches, sent in these [tag]coaching youth basketball tips[/tag] that he uses with his team. These are his personal favorites! I have only [tag]coach[/tag]ed [tag]basketball[/tag] to first, second and third grade boys and girls for the last four years. I have four children ages eight and younger, the oldest is a boy, the others are girls. My main goals are to keep the basketball fun, teach [tag]fundamentals[/tag], teach definitions/rules. 1. Get the kids tired enough to listen early in [tag]practice[/tag]. 2. Always play a game within the game to keep it fun. In order to get and keep kids attention in the beginning of practice I try to have them run some of the extra energy they have out of them. Even at 8 a.m. our teams were full of energy. We would start out with basic [tag]ball handling[/tag], then move on to our races. 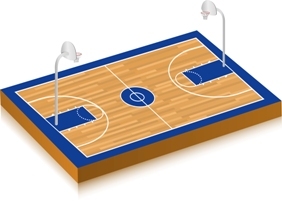 We’d get on the sideline and have races while dribbling sideline to sideline, left, right, etc. The third graders are even required to use two balls at the same time. This is a good [tag]warm-up[/tag]. After 8-10 minutes of ball handling and 8-10 minutes of running we then bring the kids into the huddle and they seem more prepared to listen to instruction. It also makes running sprints less tiresome. This is great way to start for the less mature kids who don’t focus as easily.